Zoom retracted. Please click on the picture to enlarge it. Camera not included! Zoom extended. Camera not included! 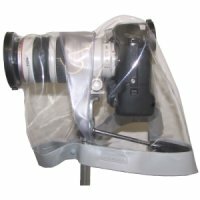 The C-Z100 rain cape is the perfect protection against rain, spray, splashed water , made to fit all SLR cameras (digital and analog) with zoom lenses. The camera is fixed directly into the front port by means of the ewa-marine CA82 adapter (until September 2017 this housing included the CA77 adapter) and step-up ring RA77-82. Due to this adapter system the cape will always remain properly positioned in front of the lens. Of course you also can use smaller lenses with a smaller filter thread. Than you have to use our step-up rings to fix it into raincape. There is also a view finder window made from a special, clear material to allow a good pre-view while protecting the camera body against rain dust and dirt. This view finder section is fixed to the camera via a set of elastic strings. Due to these two systems the cape will always remain properly positioned over the lens and the viewfinder. 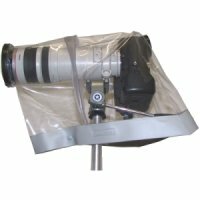 The C-Z100 raincape has been specially designed for professional Telezoom lenses. It fits lenses of different makes like the Canon 28-300, 100-400 or the Nikon 80-400 and similar lenses. You can use the camera with the C-Z100 cape on a standard tripod if necessary or desired. The C-Z100 raincape can also be closed by means of press studs to allow maximum protection or for transport. Under normal operation conditions, one would insert the right hand into the cape for finger tip control, while supporting the camera with the left hand from the outside.